Leaking Pipe Under House. I Hear Water Running. Home / Lakewood Ranch Plumber / Leaking Pipe Under House. I Hear Water Running. So, you and your family just had a great time at Siesta Key Beach or one of the many public beaches in the Sarasota or Bradenton area. Your all sandy and salty, maybe got a little too much sun. A nice shower would hit the spot. When you get home and open the front door, the sound of water running hits your ears. Your house, is the old Florida Cracker style, that is all wood and has a crawl space under it. As you investigate where the sound of water is coming from, you hear it hitting the underside of your wood floor. This is bad. As the water could warp your wood floors and ruin them. Turn off the water to the house, to eliminate any further damage. Hopefully, you know where to turn off the main house valve. If not, walk around outside the house and look for a lever handle or a round handle valve. This is not the time to wonder if it works. If you turn it clockwise or push the lever to a positive stop and the water should turn off. If it doesn’t turn off, call your local water utility company and have them shut it off at the meter. If your on a well, turn off the power to the pump. If you want to see what is leaking, then dress in your scrubby clothes. Because going under the house is a dirty job, in most cases. Get your best flashlight, remove your access to under the house and go look for the wettest spot, near where you heard water running. Once you have located where it is the wettest, have your better half, neighbor or child, turn on the water. Do you see it spraying or shooting out of a pipe? If the pipe is a copper pipe, it will be easier to fix. If is a rusted, galvanized steel pipe, you may want to call a Sarasota plumber that is used to dealing with old galvanized steel pipes. 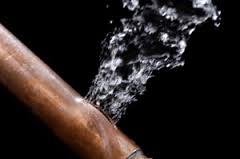 If repairing the leak is a job you prefer not to do, then call Wimpy’s Dependable Plumbing @ 941-322-1911. We give estimates on plumbing in the Sarasota, Bradenton areas. We provide plumbing for all the Keys around Sarasota and Bradenton. Lakewood Ranch Plumber? No problem we give plumbing estimates there also. If you wish, you can schedule online. www.loveyourplumber.com.